There are some beautiful places to dine out in South East Cornwall and some fabulous spots to relax with a glass of wine or hot drink and soak up one of the beautiful coastal views. Below is a list of places to eat and drink in South East Cornwall. 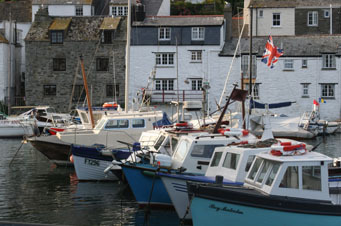 Choose from the cosmopolitan feel of harbour side Fowey, winding streets of Polperro, picture box image and tall ships of Charlestown, busy seaside feel of Looe or antique hub Lostwithiel to name just a few. There are so many places all with with lots of restaurants, cafes and pubs to choose from. Ashley and Jill Tallon look forward to welcoming you to the Four Lords, a Traditionally run Family Pub only a stones throw away from the Eden Project. Food served all day every day and there is ample parking for all our customers. A dog friendly pub in Cornwall. Children are very welcome we have a special childrens menu and high chairs. All children's meals are 2 pounds 75 pence. The bar is open from 11.00am until 11.00pm Monday to Saturday and 12.00 noon until 10.30pm on Sundays. A warm welcome awaits you at the Jubilee Inn where you can relax in front of a log fire and enjoy the friendly and informal atmosphere of the Victoria, Albert or Trelawny bars or in summer indulge in long, leisurely lunches on the newly landscaped sheltered patio or beer garden. Join us for breakfast, morning coffee, lunch, dinner or a drink. The Jubilee inn is set in the countryside in South East Cornwall near to Looe. Everybody is welcome, children and dogs included! Couples and small groups wishing to relax over a meal will love the adjoining dining room, set in the oldest part of the building its history and ambiance is delightful. For special celebrations, the dining room may be available for private dining by arrangement, giving your party a special exclusive feel. We offer accredited local ales, an extensive wine list and free wifi. All facilities have disabled and wheelchair access and staff are on hand to help customers in any way. The Jubilee Inn is a dog friendly pub and is dog friendly in the main bars and patio, beer garden. Well behaved dogs on leads are allowed. The dining room or Trelawny rooms that are immediately adjacent to the commercial kitchen do not allow dogs. They also have allocated B&B en suite rooms which are pet friendly, so they have both pet friendly and non pet friendly rooms. Welcome to the Polgooth Inn, a good old Cornish pub nestled in a beautiful Cornish valley near St. Austell where you can enjoy tasty, wholesome food and a great pint in a friendly atmosphere. In our traditional 16th Century building, we offer a choice of quality cask ales and fine wines, along with an impressively extensive menu using the finest locally sourced food. Enjoy open fires in the winter months and a beer garden, set in a stunning rural valley, throughout the year. A friendly warm welcome awaits you. Whether you are arranging a wedding reception, a celebration or simply looking for a place to meet, we have the right place for you. We are a dog friendly pub in Cornwall and so you can bring your dog along too. We serve food all day from 12 noon until 9.30pm (9pmSundays) We also have events going on at the Polgooth Inn including seasonal all day celebrations and local music and entertainment. Come and join us for the legendary Quiz every Tuesday night. Situated on the picturesque harbour of St Mawes with views of the Roseland Peninsula beyond the Rising Sun is set in a stunning part of Cornwall. This dog friendly pub combines a mixture of modern and traditional style and is open daily from 8.30am for coffees and breakfast with the main menu being served from 12 noon until 9.30 pm. Changing daily specials of local fresh fish and seasonal favourites, a good selection for children, and Sunday Lunch and Wednesday evening Carvery are all on offer. You can also enjoy afternoon tea of homemade scones and teacakes between 2.30pm and 5.30pm daily. Soak up the sun on the terrace, snuggle up in front of the Real fires or enjoy the fabulous views from the conservatory, idea whatever the Cornish weather. Craig and Nicci would like to welcome you to the Ship Inn one of Foweys oldest buildings, being built in 1570 by John Rashleigh. The Ship Inn not only offers good food and real ale, but also comfortable accommodation. The Ship Inn promises to be a very dog friendly pub in Cornwall and provides dog biscuits, water bowls and an open fire to warm dogs in the winter. Overlooking The Monkey Sanctuary grounds, the Tree Top Cafe at St Martins near Looe serves a section of delicious vegetarian food. Enjoy your meal in the sunshine on the decking, in the grassy picnic area beside the fragrant herb garden, or dine under the canopy surrounded by rainforest creatures. You don't have to be visiting the Sanctuary to stop off and enjoy their tasty menu. The Tree Top Cafe allows dogs and is a dog friendly cafe in Cornwall (although understandably the Monkey Sanctuary is not dog friendly). Set in 5 acres of private, quiet grounds, near to St Austell Cornwall, Boscundle Manor is a privately run boutique style hotel with 14 bedrooms. Dining room offering a daily changing, 3 course table d hote menu and a seasonal a la carte menu consisting of individually priced seasonal delights. The Carlyon Bay is a luxury hotel set in 250 acres of beautiful grounds close to St Austell Cornwall. The Carlyon offers a choice of places to eat each offering something different which could make it a good place for you to eat in Cornwall. The Bay View Restaurant with beautifully cooked food and magnificent views over the bay, Taste, a contemporary and informal brasserie using the best local ingredients, The Terrace Lounge ideal for morning coffee, light lunches, afternoon tea or al fresco dining and finally the golf course Clubhouse for drinks, snacks and meals. Booking for all venues is advisable.